The scars we bear, both physical and psychological, ultimately shape us more than we would ever like or care to admit. We live our lives in accordance with the things we want to avoid, with the knowledge that tremendous pain and suffering not only exist, but can only be staved off rather than circumvented. Many people who end up living lonely lives have been hurt and scarred in some ways, enough to make them lose faith in the world around them. In Kathy Reich's Two Nights we are presented with just such a heroine, named Sunday Night. Sunday, more often than not referred to as Sunnie, is a woman with a rather tragic past, always trying to outrun the demons from the days of yore. Despite their immeasurable influence on her, she manages to acquire some form of stability through a life where she neither depends on nor needs anyone. She keeps to herself and feels nothing for the world, having betrayed and scorned her for what feels like an eternity. However, one day this life of utter isolation and loneliness comes to an abrupt stop: in the aftermath of a bomb explosion, a little girl has gone missing. Her grandmother plead to Sunnie for her help in finding her granddaughter, and ultimately she agrees. As she begins to examine the whole affair, many questions begin to severely complicate the picture: Is the girl really still alive? Is she lost somewhere, or was she kidnapped? What relation did the bomb have to her disappearance? Perhaps most importantly, does she really want to be found in the first place? Even Sunnie's cynicism can't shield her from the despicable darkness she is about to venture into... not only the girl's, but also into the heart of her own. As you might have gathered from this brief introduction to the story, this isn't the type to include rainbows and unicorns. The majority of the novel is dark and rather depressing in its nature, shining the light on humanity's dark side more than anything else. At the centre of this darkness we have Sunnie, our heroine, traumatized by her childhood, a tumultuous military service and a heartbreaking service in the police. Not to say that people haven't gone through what she has and worse, but it feels like Reichs really tried to create a character that has been broken by life in every way imaginable, and there are parts where it feels a tad exaggerated. As a result, Sunnie herself isn't exactly an uplifting protagonist. She's rather damaged and spiteful of the world around her, she isn't intent on changing anything about herself or the environment, and is, on the whole, not all that likeable. Of course, with this being a series, I can imagine that the author has purposefully left some room for emotional growth and development in future novels... because it seems quite necessary if Sunnie is become a mainstay. With that being said, while she may not be completely likeable, she is still fascinating enough to follow on her investigation. She is intelligent, witty and capable when it comes to time to take action, so it's not as if there were no redeeming factors to speak of. She is a strong female character with potential, and I think ultimately it's worth bearing through her turmoil to see the story advance. Looking beyond the main character and all she stands for, what we see is a very competent and intriguing mystery that does a fine job at keeping you hooked. The action moves along rather quickly, which isn't all that surprising for a Kathy Reichs novel; she has always demonstrated a laudable command of pacing in virtually all of her novels. Sunnie's investigation takes us from coast to coast and we're seldom given much time to process the information we have before we are fed something new on top of that. As expected, there are numerous twists and turns, and they bear the distinction of being logical and foreseeable if you put some effort into it, at least for the most part. In other words, this is one mystery that actually rewards those who are willing to put their little grey cells to work. The plot is also given a bit of a hand by all the secondary characters that we come across on this sombre and unforgiving journey. Reichs has a talent for making them feel realistic with a minimum amount of effort, so to speak. The grandmother's grief and worry is perceptible, with a tiny hint of suspicion that always keeps us on edge. Sunnie's twin brother seems to be her polar opposite and we're immediately drawn by the thoughts of what history must have transpired between the two. We even form a bond with Stella, the missing girl, even though we only know her through descriptions rather than actual acquaintance. 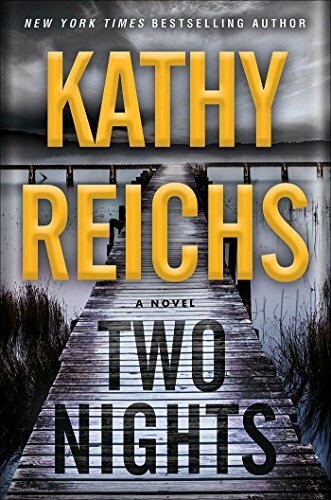 Two Nights by Kathy Reichs is ultimately an engaging mystery thriller that does a phenomenal job of keeping the reader hooked until the end. Despite the small inconveniences that come with the protagonist's inner nature, she remains interesting enough to follow and certainly has potential for future growth. If you enjoy missing person mystery thrillers, then you certainly can't go wrong with a Kathy Reichs novel, much less this one. Kathy Reichs is forensic anthropologist, academic and crime writer, without forgetting her work as a professor of anthropology at the University of North Carolina at Charlotte. She released a number of novels drawing heavily from her experiences in her field, and those include Cross Bones, Break No Bones, Bones to Ashes, and plenty of other "Bones" books, upon which the television series is loosely based.